SupraStore Brand Parts - SupraStore 2JZGTE STROKER CRANKSHAFT 4340 ISO Billet CHROME MOLY 94MM 2JZGTE! Home POWERHOUSE RACING, SUPRASTORE & MORESupraStore Brand PartsSupraStore 2JZGTE STROKER CRANKSHAFT 4340 ISO Billet CHROME MOLY 94MM 2JZGTE! SupraStore 2JZGTE STROKER CRANKSHAFT 4340 ISO Billet CHROME MOLY 94MM 2JZGTE! Completely CNC machined from solid round, ISO 9001 4340 Chrome-Moly Steel. 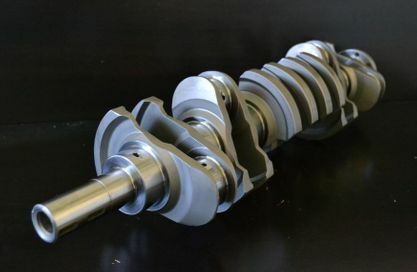 The factory Toyota crankshaft weighs 59.8 lbs (27kg) with the Precision Dynamics 94mm crankshaft weighs in at 48lbs (21.7kg), minimizing rotating mass and offering every bit of strength and more as it is a billet manufactured piece. This is the foundation used by ALL the Pro Teams and is the latest trend in Supra performance motors. If you couple this 94mm stroker crankshaft with a 87mm bore piston, this will yield 3.4 liters. SupraStore.com can provide you with the same extreme stroker pistons ran by Titan, as well as any rod you require to complete the kit. 2JZ stroker kits are designed to work with standard length rods, which allows you to run any rod. Stroker pistons are custom and available in any compression. Please contact us and let us know what your build plans are, and we will be happy to help! !